Minister with responsibility for Public Utilities on Nevis Hon Carlisle Powell publicly commended the staff of the Nevis Water Department for their revenue collection efforts in 2008 which raked in $4,225.905 to the island’s coffers. The Minister’s disclosure came when he contributed to the 2010 Budget debate at a recent sitting of the Nevis Island Assembly in Charlestown. “I am happy to report that without any increase in the cost of water to our consumers and with the Four Seasons still closed, due to improved collections, by the end of October we had already collected $4,223,560.24 and I want to thank all the members of the office,” he said. Mr. Powell said apart from the improved revenue collection, the Department had also made strides in other areas which included the completion of 1,970 feet of extension to the 4inch mains at Bath Village which ends in the vicinity of Von Radio; upgraded the pipe network and the placement of 12 fire hydrants from Cole Hill to Chicken Stone. The Department was also able to complete the installation of a new pumping station at the Jessups Reservoir which feeds the communities of Spring Hill and Barnes Ghaut. “This has allowed us to create a new distribution system in the Barnes Ghaut area from the Upper Jessups tank which has a capacity of 100,000 gallons of water. “We did this because we want to be able to supply the new villa project in the paradise area. We also want to make sure that the people of Barnes Ghaut never again suffer from the lack of water,” he said. According to Minister Powell, work was in progress to upgrade a 6inch line to an 8 inch which ran from Golden Rock to the government owned reservoirs at Stoney Hill. The upgrade which was done with polyethylene pipe and the electric fusion jointing technique would make provisions for an extra booster pump at Fothergills to send more of the water produced by the new BEAD well at Business Ghaut and the well at Padlock and Hickmans to the reservoirs at Stoney Hill and other areas further down the line to Charlestown. “Since the late 80’s the Golden Rock Hotel has suffered from low pressure. I am happy to report that in November we installed a new dedicated 1 inch line that now serves the hotel. The owners of Golden Rock Hotel have shown confidence in this NRP Government by completing a magnificent upgrade. Now, like the rest of Nevis, they have an adequate supply of water,” he said. Mr. Powell also pointed to completed repairs to reservoirs at Fothergills, which he said had helped the Nevis Water Department to save thousands of gallons of water which had been wasted on a daily basis. With regard to the housing projects the Minister noted that they were all connected to the water system. For 2008 the Department had received 281 new applications for water out of which 217 had been connected. In the area of staff training, Mr. Powell said that through an alliance between the Nevis Water Department and the Montserrat Public Utilities, six persons had benefitted from overseas training within the past four months but a total of nine have trained for the year. 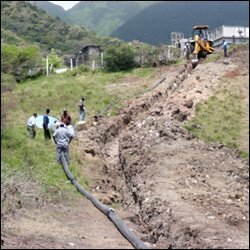 The Department’s management personnel have also been engaged in discussions with the St. Kitts Water Services on the issue of attachments for field workers on any new technology that both departments would utilise in the future and was hopeful it would be implemented in the near future. Mr. Powell also spoke to future undertakings in relation to Nevis’ future water sustainability. “The Caribbean Development Bank has agreed to fund a water development project for Nevis to deal with the short, medium and long term needs of the water sector. “This will allow us to complete the upgrade of our distribution and pumping system as well as the provision of new reservoirs, pumps and institutional strengthening,” he said. The Public Utilities Minister also spoke to the implementation of aspects of the Nevis Water Master Plan. The first phase of the project is estimated at $20 million. He said the Nevis Island Administration had also planned to look at how best to continue the development of water whether as a department of government or as a new entity.